Of course not on the set from Grey's Anatomy, but playing Lulu in the movie Cake. Sandra wears a scarf style triangle top with flowery triangle cups that offer half cup coverage and fasten behind the neck with halter straps. The triangle cups of this halter bikini are not sliding. This halter bikini has a stylish under bust band that ties behind. 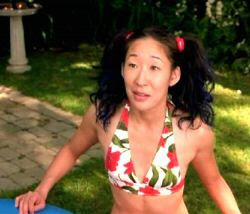 All in all a beautiful bikini yet still it doesn't suit Sandra Oh that well.